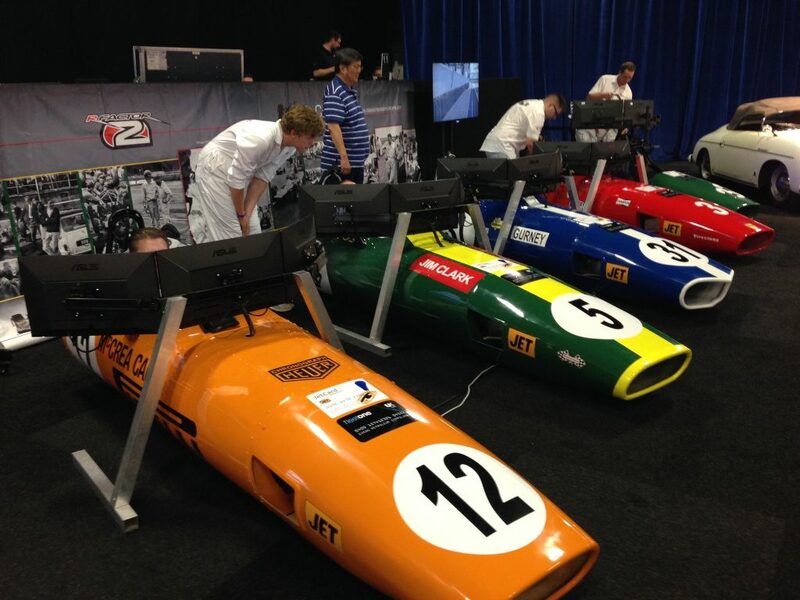 Classic Race Simulators helped provide some great entertainment at RM Sotheby’s recent London sale in Battersea Park. Visitors to the exclusive sale, which grossed in excess of £21,000,000, were treated to a racing experience they’ll never forget thanks to the state-of-art simulation software and authentic period racing bodywork in a range of evocative liveries. 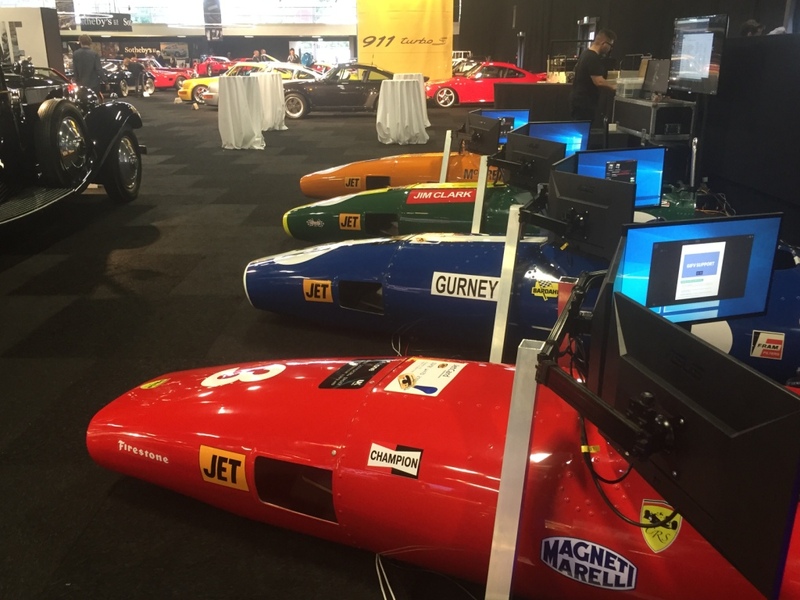 When visitors weren’t perusing the 87 wonderful classic cars on offer at the auction, they were able to take advantage of the four simulators, either racing against the clock or in races against one another. Further fun was had from the big screens which allowed all the racing action to be displayed to the audience in real-time. 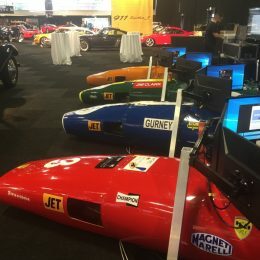 The crowd-pleasing simulators feature replica liveries inspired by classic Formula One cars of the 1960s, including those reminiscent of iconic Lotus, Ferrari, Eagle and McLaren designs. The company can provide bespoke, custom made simulators for any occasion, and attends numerous events, corporate functions and conferences. A great way to entertain the crowds, they have recently been used by JET to provide captivating entertainment at its Silverstone Classic Hub. 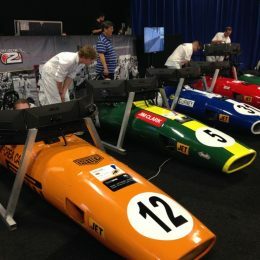 The company provided 10 of its 1960’s replica F1 race simulators at Silverstone, which saw over a thousand people enjoy the experience over three days. Branded with JET logos and featuring the classic Silverstone circuit, the simulators delighted the crowds. Each simulator is unique, featuring a full nose cone with mesh grille, adjustable pedal mounts and seating, and a stainless steel roll bar. Each simulator’s livery can be fully customised to suit a customer’s wishes or to accommodate corporate branding. Available for hire or outright purchase, each simulator utilises the celebrated rFactor 2 racing simulation software from Image Space Inc. to create the most realistic and unforgettable driving experience possible. For anyone considering a great hospitality activity over the Christmas period, contact Classic Race Simulators via the website, or call us on +44 (0)1252 516693.